Seven Wonders That Will Change Your Life. Where does the courage to persevere come from when everything seems hopeless? Why is it nearly impossible to succeed with faith? How much do family and friendships matter in our journey? How do we break down our walls and reveal our inner truths? What does having compassion really mean? How do you tell real friends apart from those who are holding you back? If there’s no one to blame for my past, what do you do with your anger and resentment? As you unwrap each of the seven wonders for yourself, you’ll discover exactly what Glenn Beck found as he transformed his own life from darkness to light, from dead ends to endless possibilities, from addiction to freedom: it doesn’t take a superhero to find the strength to change—it just takes the courage to take the first step. This book, which was only possible by combining together decades of personal struggle with world-class professional experience, can be that first step for you. The 7 Wonders grows out of a unique friendship that we’ve developed over the last five-years. It is unique because it brought together a psychiatrist who naturally burrows toward the truth, and a recovering addict who spent decades running from it. As we spent more time together we began to let our guards down. Over time we reached a level of honesty with each other that is rare. As a result, we learned that the principles that have guided the well-honed healing techniques of one of us are precisely the same principles that instinctively guided the other to replace nearly unbearable pain with genuine happiness. We believe that it was God’s plan for us to meet; that it was God’s plan for us to speak so openly with one another; and it was God’s plan that we share with you the seven wonders we discovered together. We also firmly believe that it was God’s plan that this book now finds you at this exact moment in your life. There are plenty of issues that I may disagree with Glenn Beck on from a political, religious or economic perspective. But there is one thing that I can't disagree with: His focus on the practical application of values and principles. Principles and values are the ladder that Beck used to climb out of his alcoholism and self-described "slime-ball-ness." Principles and values--and not moral relativism--are what builds great character, families, communities, and countries. 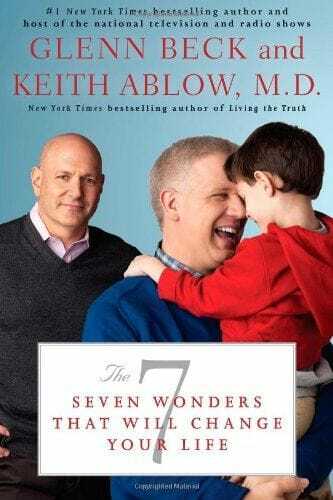 While people of good faith may differ on what the guiding values and principles should be--there can be no question that Beck and Ablow have selected 7 powerfully simple principles and values which, if applied--can and will--change lives. Excellent book! Excellent family values! Something to read and discuss with your children especially preteens who are so vulnerable to peer pressure and heading down the path of rebellion. Teach them how to think for themselves and the other options available for them other than following the crowd. How to have self-value which will give them a brighter future. I ordered this for my Kindle less than 48 hours ago, and I couldn't put it down. It is exactly what I have been looking for. There are some people who just instinctively know how to act and what to do in this life to realize their potential. There are others, like me, who have been through truly painful experiences that continue to hold us back. I have been searching for a way to analyze events, relationships, etc., in a manner that would help me figure out what direction to go in. It has all been at my fingertips, but I just didn't know how to put it all together. This book is life altering for me. EVERYTHING clicked for me as I read it. It was a joy to read. I know exactly where to start and how to move forward now. It connected all of the dots in my thoughts. It is brilliant, truly brilliant. Every word of it rang true for me. I don't know how these two men were able to word it so beautifully and concisely, but they did it. It all makes sense and it will change the world if we let it. The friendship part really gave me the insight I craved regarding my relationships. I didn't know how to figure out what was going wrong with my friendships and why I felt so uncomfortable around some people. I get it now. I wish I could shout from the rooftops to everyone I love...."Go buy this book immediately and read every word! ".